This collection consists of the records of Eli Attie from his time in the White House Communications Office. 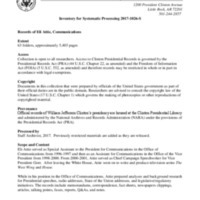 It consists of analyses and background research for Presidential speeches, radio addresses, State of the Union addresses, and legislative / regulatory initiatives. The records include memorandums, correspondence, fact sheets, newspapers clippings, articles, talking points, faxes, reports, Q&As, and notes.